Sometimes the night just gets away from me, and before I realize it, it's 11:00, I have work in the morning, and I still haven't taken off yesterday's manicure. This means at least another hour before I can go to bed if I want to update my paws. That's what happened last night, so I went with a simple stamp with some mini beads. This picture's best for seeing the bead detailing on my ring finger. 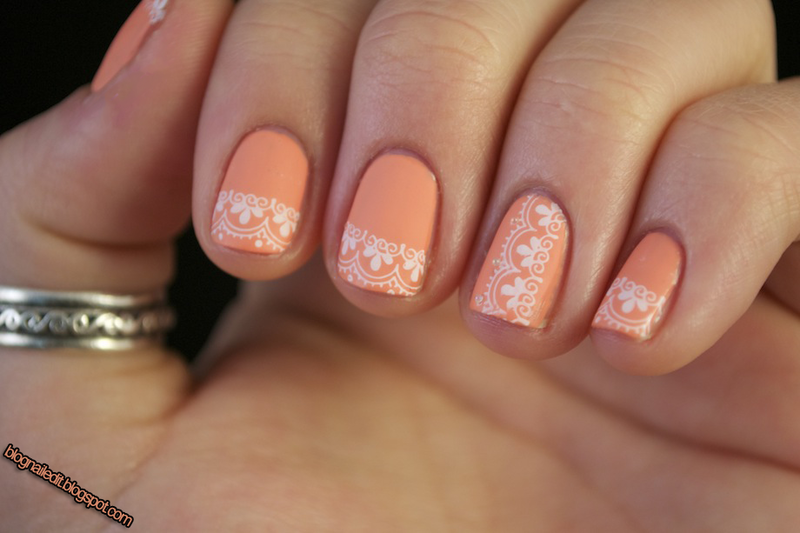 The stamp is from Konad's m57 plate, and the white is stamped with Sally Hansen's Insta-Dri Whirlwind White. It's all topped with China Glaze's Matte Magic to soften this already feminine manicure. @KimsKie's Nails You're right! Any requests? This is really pretty! I love lace! This is so pretty! I love how the ring finger is different!